The rise of e-commerce has led to a greater assortment of retailers. 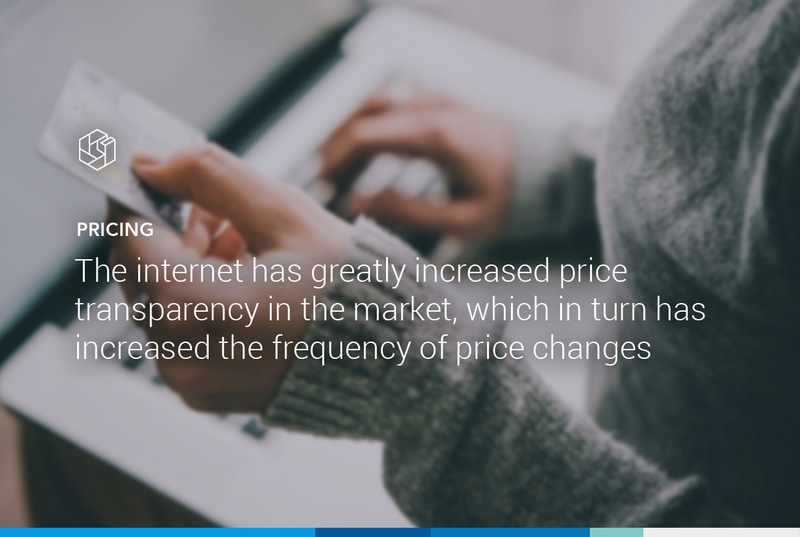 In addition, the internet has greatly increased price transparency in the market, which in turn has increased the frequency of price changes. The combination of these two factors made dynamic pricing a necessity in today’s retail market. And as part of the Five Steps to Successfully Implement Dynamic Pricing, retailers need to choose a pricing method that makes sense for their organization. Dynamic pricing is often equated with a purely competitor-based pricing method. For example, “Always adjust the price to the lowest of the three competitors X, Y and Z”. Competitor-based pricing, however, isn’t the only dynamic pricing method, nor is it the most recommended pricing method. Three dynamic pricing methods are outlined in this blog post. 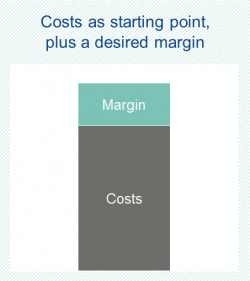 The most straight-forward pricing method is cost-plus pricing. The starting point is the cost per product, where the desired margin (percentage or € amount) is added to calculate a selling price. If the cost per product changes daily or even hourly (due to changing suppliers or dropped shipping for example), it is necessary to implement this method dynamically. How can I apply the cost-plus pricing method in Omnia? This method is easily implemented in Omnia. Create a new variable with the formula editor. Start with the purchase price and add all other product costs from your feed plus a desired margin, possibly at the product-level. Include this variable in your strategy settings as a lower & upper limit and you are set. 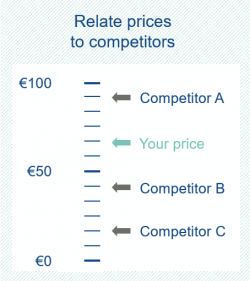 With competitor-based pricing, products are priced relative to (direct) competition. For instance, a company might want to undercut a certain competitor. Or, a company might want to maintain a certain price position in the market. It is a common strategy for retailers to match prices with their most important competitors for certain products. Retailers specialized in electronic products have the highest frequency of price changes and other product categories are likely to follow with an increasing frequency. Therefore, it is essential to implement this method dynamically to not lose any market share. How can I apply competitor-based pricing method in Omnia? 2. Apply this action in the Strategy settings within Omnia to a part of your assortment based on a variable, such as: brand, category, color or even stock. An example: raise price above the average of the market when stock is below 10. By far, the most recommended pricing method by experts is value-based. It is a dynamic pricing method based on the economic principles of demand and shows the best results in additional sales & total margin. As the true value of products is difficult to uncover, consumers’ willingness-to-pay functions as a proxy for the perceived value. Omnia calculates the price elasticity of products to uncover consumers’ willingness-to-pay for the combination of product and retailer. 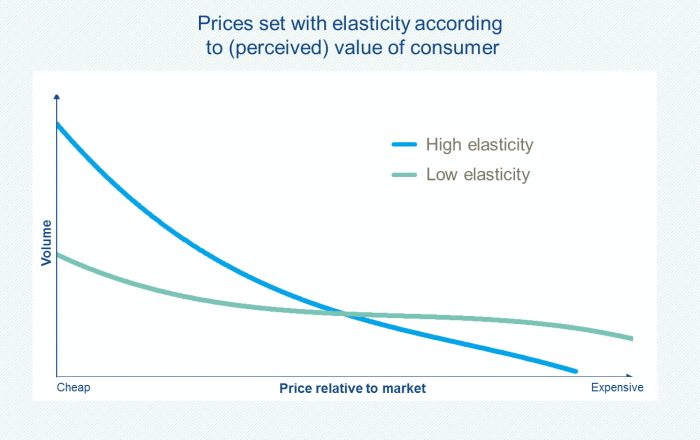 A product with high price elasticity is very sensitive to price changes as consumers value the product less than a product with low elasticity (keeping all other things equal). Over time, Omnia learns how much consumers are willing to pay for the product at each price point relative to the competition. Combining this data with the product’s marginal costs, Omnia calculates the optimal price: maximum profit with the given price elasticity. How can I apply this method in Omnia? No action needed! Omnia’s algorithm automatically calculates prices based on price elasticity on product level. After a few months of gathering sales data and comparing prices against those of the competitors, Omnia has sufficient data to determine the price elasticity of products and categories. No "black box": Omnia is completely transparent about the decisions of the price setting process. For more information about our dynamic pricing & marketing software or guidance on how to implement these pricing methods, please contact us via info@omniaretail.com or call +31 (0) 35 699 02 22.